Here's the first September sale as I'm told that the Antibes office of Camper & Nicholsons closed the deal on the 43.28m motor yacht Pure Bliss yesterday with Andrew Cosgreave at Northrop & Johnson introducing the buyer. 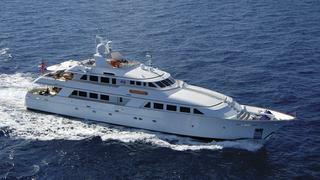 Pure Bliss was built by the Palmer Johnson yard in Wisconsin, USA in 1997 to a design by Tom Fexas and refitted in 2008. The standards to which Pure Bliss was built to and the quality of her finishing is a testimony to U.S. yacht building and her previous owner who maintained her regardless of cost. Lloyds classed and MCA compliant, she accommodates 12 guests in five staterooms while twin Detroit Diesel engines deliver a cruising speed of 14 knots and a range of 3,500 nautical miles. Pure Bliss was asking $7.45 million.